Today Life as Mom is featuring kids’ birthday cakes for the Ultimate Recipe Swap. I made the one featured below for my 2 year old’s birthday last year and posted about it. He’s still talking about the duckies! Our two year old, whose birthday we were celebrating, loves his “rabbi” and “duckie” very much – a perfect theme for a toddler birthday party. I made a sour cream pound cake and baked it in two eight inch round pans about three inches high. For the icing, I used the Neoclassic Buttercream from Rose Levy Beranbaum’s The Cake Bible . It’s super easy to make and almost foolproof because of the corn syrup used for the simple syrup. It also tastes good; my husband helped himself to a few teaspoons! Next time I will make a double batch of icing ahead of time just for insurance; this time I needed just a bit more than a regular batch to ice the cake. For the duck (pictured) and the rabbit on the sides of the cake, I used store-bought ready-made fondant and cookie cutters. Next time I will make my own fondant, but being new to using fondant, I didn’t want to attempt too much this time. The fondant was a bit hard to roll out, but it wasn’t difficult to work with. The white decorations on top were made with egg whites and confectioners sugar. In the heat, this icing combination did not do too well. In the middle of each rosette, I put a silver dragee. If the icing had done better in the heat, I would have iced around the bottom of the cake. 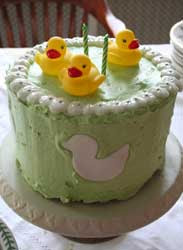 The rubber ducks on top of the cake came from the baby shower section at Party City. I had originally planned to put more fondant ducks on top, and then discovered that I was missing some very small cookie cutters. One last note – I spread a thin layer of strawberry jam, warmed in the microwave, between the layers of the cake. It’s a small touch, but adds a little extra taste to the cake. For more cakes, visit the Ultimate Recipe Swap at Life as Mom.